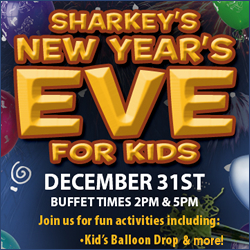 Join in the New Years Eve fun this year (into next) at the Downtown Aquarium with Sharkey’s New Years Eve for Kids. Fun activities include: a Kids Balloon Drop, Sparkling Cider Toast, Contests and Giveaways, Sharkey Photos, Animal Interactions, and much more. Both Kids and Adult Buffets are also available (check for pricing).